Body Condition Score (BCS) charts come in 1--5 and 1--9 versions. The BCS is useful for predicting size & weight with frame scores in young cattle. BCS is used to adjust feeding strategies to reach optimal weight. It is also a standardized description for communicating with your veterinarian, buying or selling cattle and or other situations. Since body condition greatly affects reproductive performance as well as feed efficiency, knowing and monitoring BCS can influence a producer’s bottom line. If breeding at 14-15 months, (to calve at 24 mos) heifers should weigh 60 to 65% of their mature weight. Take her body weight x .03 = minimum lbs. 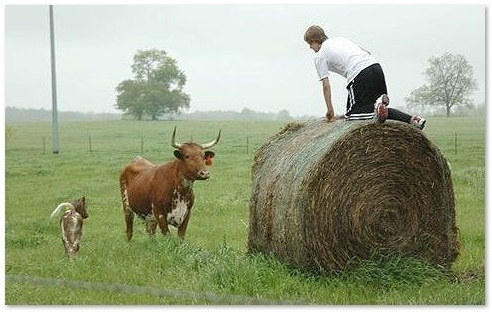 hay a day needed. Free choice in very harsh winter weather. 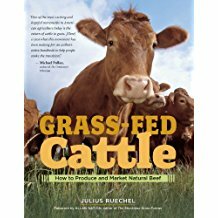 If pasture is rich and your mini cattle begin to get too fat, you will need to reduce the time they graze. When they are too fat, they could have trouble breeding or calving. In dairy or dual purpose cattle, over conditioning can lower milk production. In that case, reduce their time on rich pasture to approximately 6 hours a day. Experiment. Put them into a corral and feed hay the rest of the day or night. 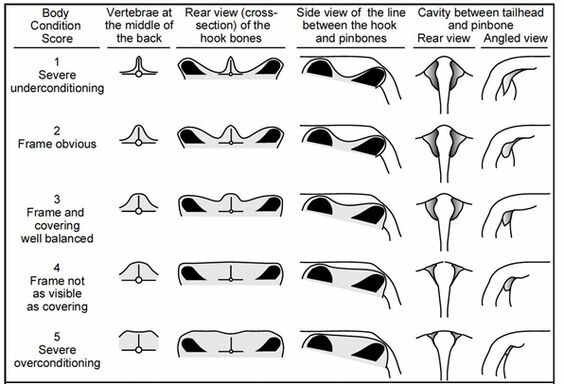 In this article Julius Ruechel explores the powerful correlation between body condition at calving time and conception rates. He shares some management changes you can make on your farm to take advantage of this powerful correlation so you can increase conception rates in your herd while reducing your production costs at the same time. The main areas to feel are the short ribs of the loin, over the long ribs and the tailhead. Pinch out of a fold of skin next to the tail to feel how much fat there is. As the skin is about 6mm thick, deduct 12mm from the total thickness to estimate the fat thickness under the skin. 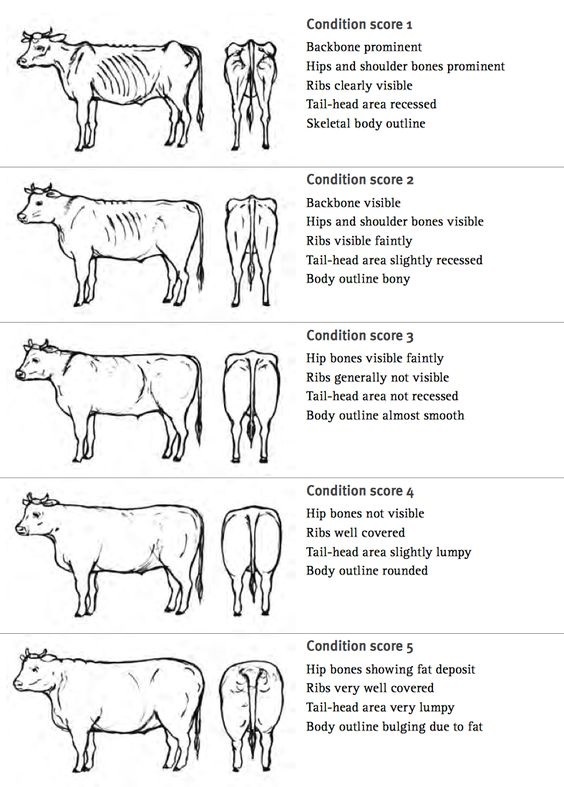 Always assess fatness first - it is easy to be too generous in muscle scoring with very fat cattle. While there is some debate as to the importance of carcass conformation or muscle shape, research has shown that retail yield increases 1.5% for each increase in live muscle score (not carcass muscle score) at the same live-weight and fatness. Muscling is assessed into 5 scores, A to E, with A being the most muscular and E being to least muscular. Muscle scores do not infer a quality standard but rather describe the thickness and shape of the muscle in relation to frame size. 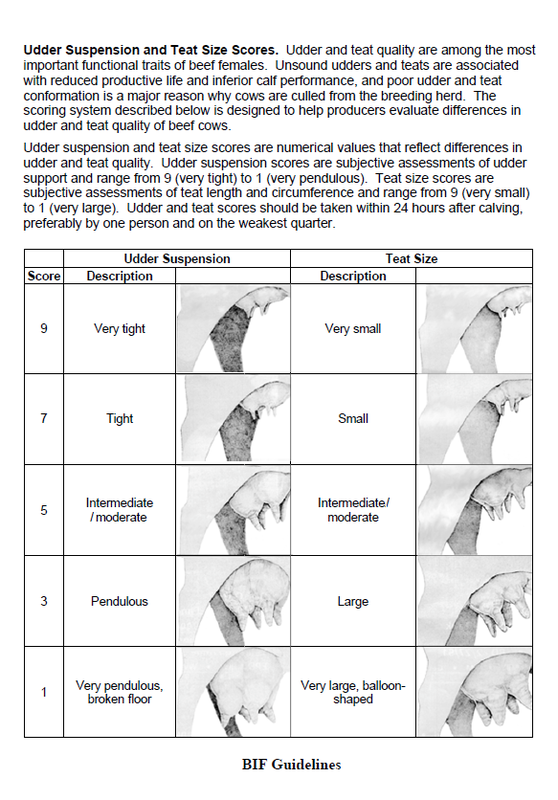 Muscle score should always be compared within animals of similar age and frame type. Heavily muscled cattle stand with their hind legs further apart that lighter muscled animals. From the side, observe curvature of the muscles of the thigh. Muscle seams are clearly evident in heavily muscled leaner cattle. Also observe the thickness of the forearm. 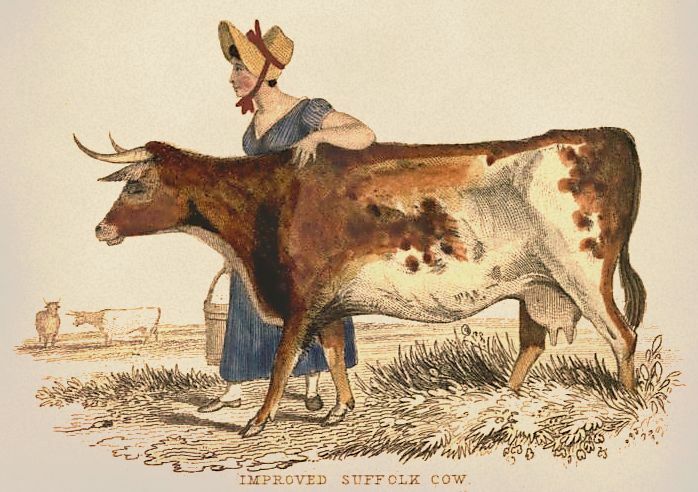 Heavily muscled cattle have a more expressive forearm then more lightly muscled cattle. From these data, expected progeny differences (EPDs) for calving ease direct and calving ease maternal, can be calculated. 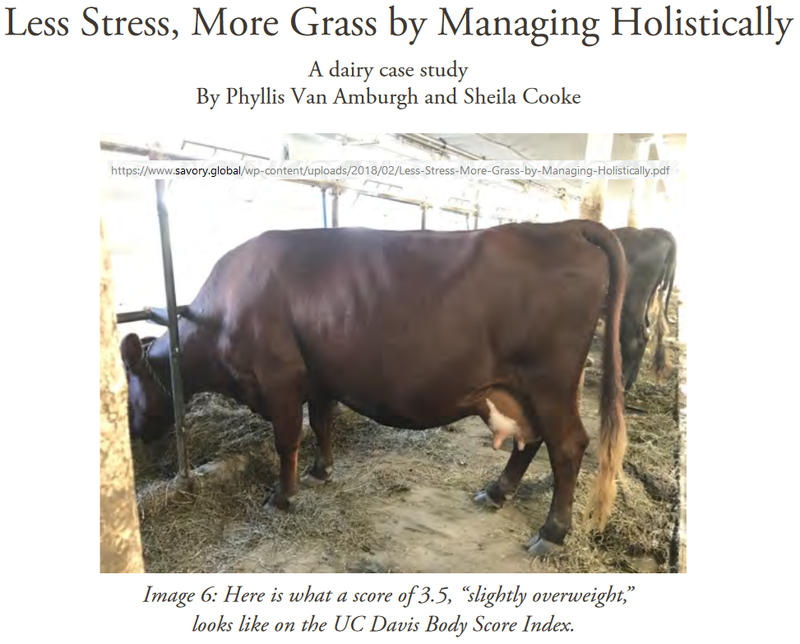 Scores of 5 should not be included in any formulas or evaluations, though, because abnormal presentations (backwards, breech, etc.,) are apparently not heritable either as a trait of the calf or of the dam. 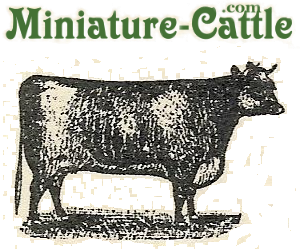 When selecting Miniature Cattle and other breeds for homesteads, temperament is an important consideration. Small acreage cattle should display a calm and quiet disposition. They should not exhibit panic when approached, which can be determined by ears perking, excessively alert eyes, or constant defecation. They should not exhibit any aggressive behavior toward humans, even when penned. Mild disposition. Gentle and easily handled. Stands and moves slowly during processing. Undisturbed, settled, somewhat dull. Does not pull on headgate when in chute. Exits chute calmly. Quieter than average, but may be stubborn during processing. May try to back out of chute or pull back on headgate. Some flicking of tail. Exits chute promptly. Typical temperament is manageable, but nervous and impatient. A moderate amount of struggling, movement and tail flicking. Repeated pushing and pulling on headgate. Exits chute briskly. Jumpy and out of control, quivers and struggles violently. May bellow and froth at the mouth. Continuous tail flicking. Defecates and urinates during processing. Frantically runs fence line and may jump when penned individually. Exhibits long flight distance and exits chute wildly. May be similar to Score 4, but with added aggressive behavior, fearfulness, extreme agitation, and continuous movement which may include jumping and bellowing while in chute. Exits chute frantically and may exhibit attack behavior when handled alone. Extremely aggressive temperament. Thrashes about or attacks wildly when confined in small, tight places. Pronounced attack behavior. Runs along fences, will stand in corner if humans stay away, may pace fence. Runs along fences, head up and will run if humans move closer, stops before hitting gates and fences, avoids humans. Runs, stays in back of group, head high and very aware of humans, may run into fences and gates even with some distance, will likely run into fences if alone in pen or herdmates not visible. Pronounced attack behavior if approached. Even when defensive retreat (flight) is available, chooses offense (fight). Will put you over the fence or take you.